12.31.18 What better way to start 2019 than marrying your best friend? Kellye & Trevor did just that. The red velvet bridesmaid dresses, plus the bride's fur shawl and the groom's green velvet loafers were the perfect accessories for an end of December wedding. 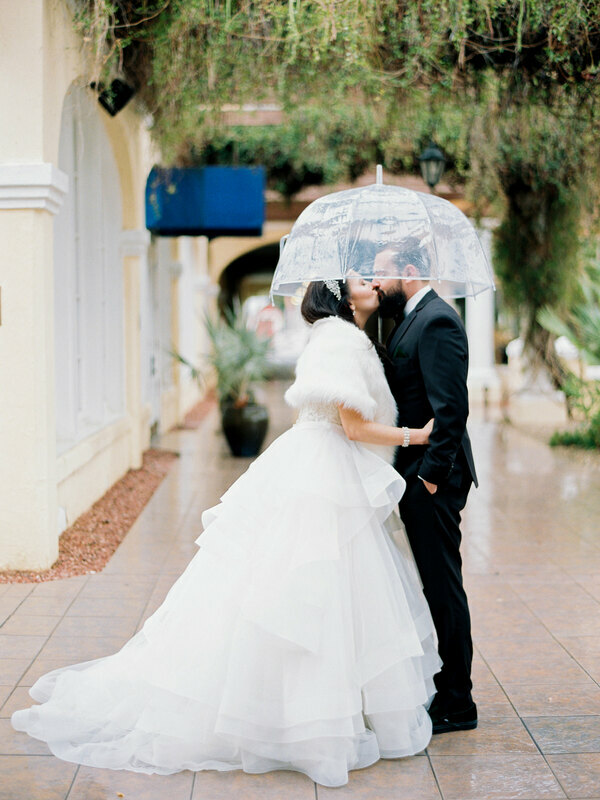 We also love the clear umbrella that made the slightly rainy day, even more magical! This wedding has all the dreamy Boho goodness you could ever hope for! 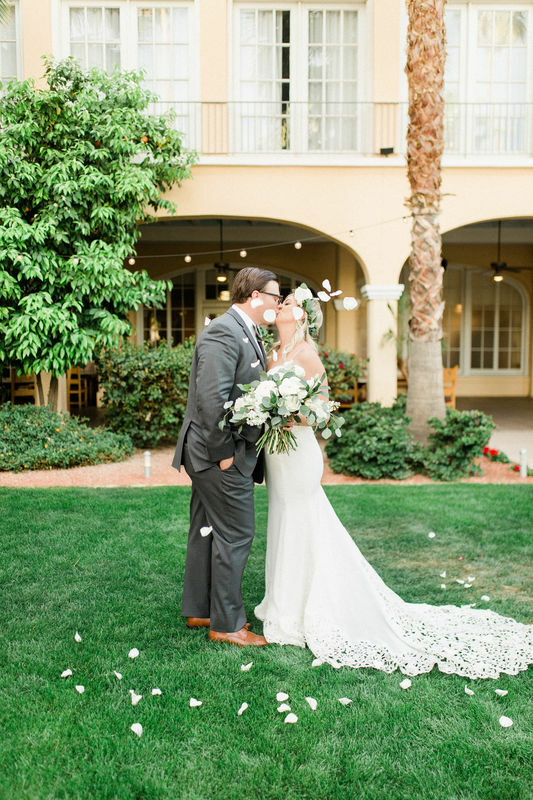 Becky and JT used a rich color palette, lining our pergola with multi-colored boho rugs, rustic benches and chairs, dramatic floral arrangements plus a stunning hexagonal ceremony arch. To top it all off, roses and other floral blooms were placed in our 100 year old vines. We can't get enough of this laidback, yet elegant and whimsical wedding. Before we say, "I Do". We had the absolute pleasure of being apart of Marisa & Ryan's big day. Marisa spent her morning getting ready in one of our suites before meeting her husband-to-be for bridal portraits. Here are just a few of the beautiful pictures captured at San Marcos Resort on their special day. 7.21.18 Melissa & Tom, it was such a pleasure to be apart of your special day. We love this sweet family. Together, Melissa and Tom have four daughters! 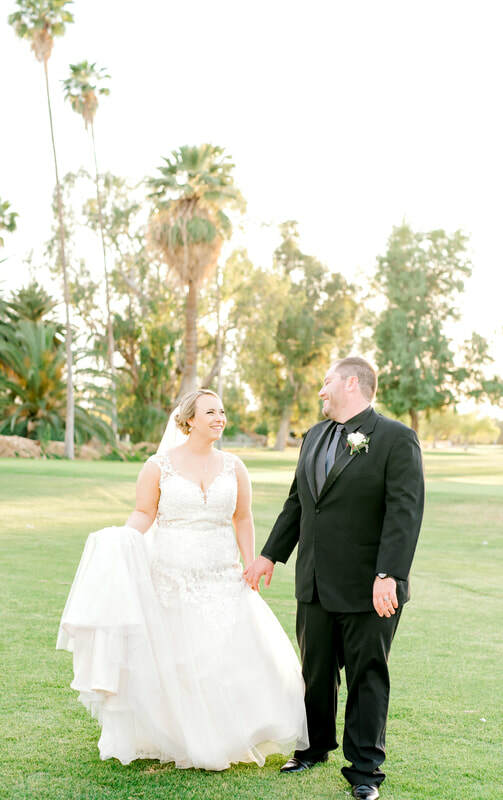 Melissa and Tom first met on a blind date, right across the street from our resort, at San Tan Brewery. The newlyweds enjoyed walking over to where they first met, and capturing some memorable photos with the help of the San Tan Brewery crowd! 4.20.18 So much love, time and care went into Nicole and Eddie's big day. We love the details, photos and signage they displayed. Nicole's sweet mom planned a big portion of the wedding. Nicole and her father shared a special moment on the dance floor when they broke into a surprise choreographed dance, instead of the traditional father-daughter dance. From providing bathroom baskets, to taking group shots with each table on the dance floor, Nicole and Eddie made sure their guests were appreciated and taken care of. 3.24.18 One of our most memorable weddings, Leah & Dave's special day was breathtaking, and full of surprises. The bridesmaids wore elegant grey dresses, while the groomsmen sported bold floral ties. 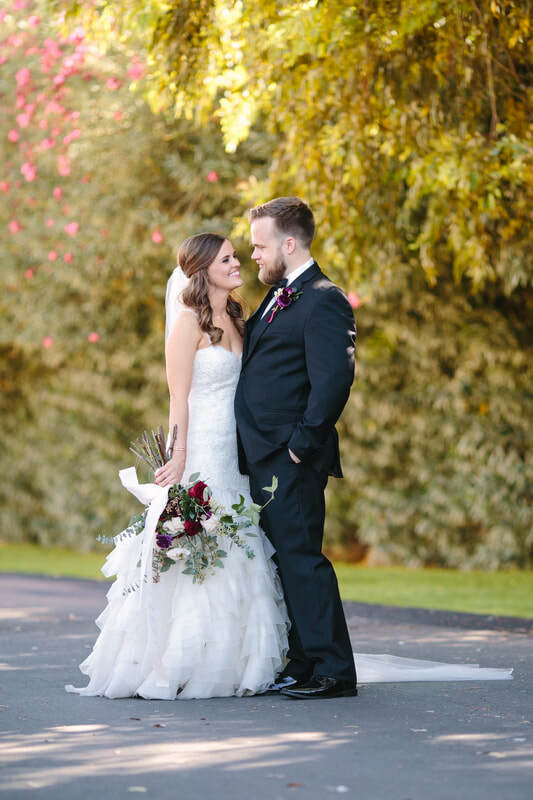 We were "wowed" by the bouquets, greenery, and wood details. Leah and Dave walked down the aisle to Russell Dickerson's song "Yours". Amazingly, Russell was performing downtown, and heard about the newlyweds who just walked down the aisle to his song. Russell decided to surprise Leah and Dave with a private concert of "Yours". You can imagine their excitement! The night continued on La Terraza, and the celebration really began. Talk about a perfect day!! 5.20.17 Jenae & Michael made us swoon at this romantic wedding. The men sported a relaxed preppy look complete with polka dot bow ties; while the ladies looked beautiful in soft pink and pearls. 3.25.17 We are feeling the love at Mallory & Eric's wedding. Lia photography perfectly captured all the joyful and sweet emotions of the day. The weather only made the day more special. This fun couple even explored downtown a little after their wedding! 3.25.17 Cory & Kevin. We love the love at this wedding. The greys, pastels and whites made the perfect backdrop to this beautiful couple. 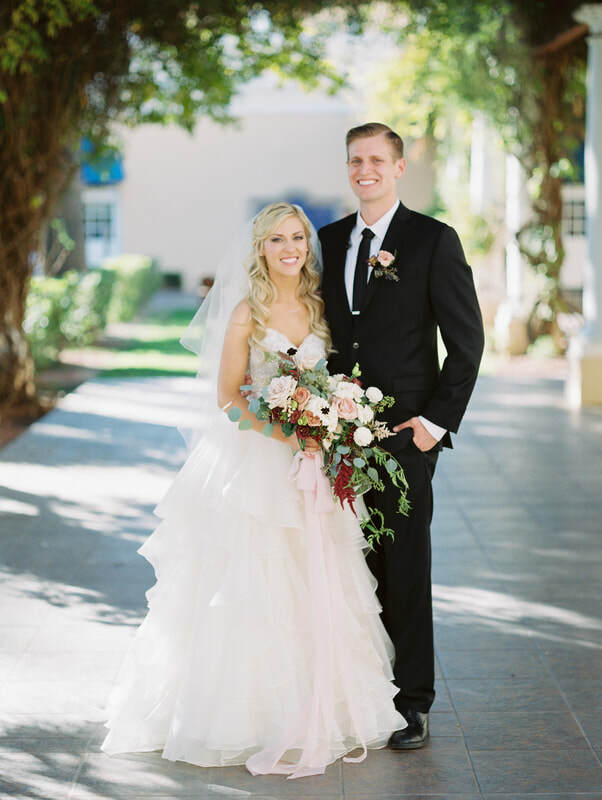 Our Fountain Courtyard and Ballroom were beautifully transformed for this special styled shoot. Thank you to Depoy Studios for taking these photos! 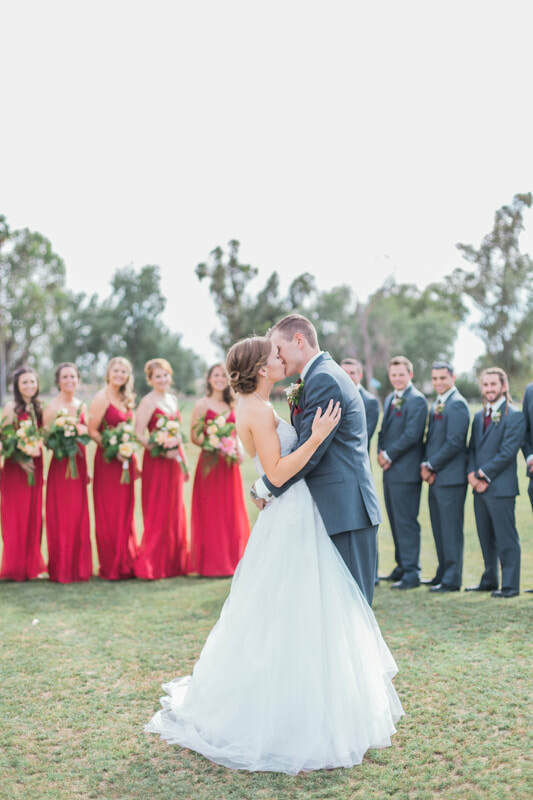 2.17.18 Chris & Ryan's wedding day was not only perfectly Arizonan, but also beautifully emotional. Wait till you see the emotions in these images! Their signature cocktail was a Wisconsin Old Fashion, the couple's favorite cocktail. The use of candles, lights, greenery, cactus and copper became the perfect backdrop. We also loved their "For Richer or For Poorer" wedding favors they placed at each table setting. The bag contained a scratch off lottery ticket, along with a penny for scratching. 11.11.17 Ericca & Joseph are such a fun couple! For starters, they are mega fans of the Arizona Diamondbacks. Have you noticed their color scheme? Joseph even had Baxter help with his proposal to Ericca! Thanks to Ericca's sister, Desiree, the reception space was a total surprise for the happy couple. Ericca's father made the day even more special by customizing favors for all the guests, and even aprons for the staff! Before we say "I Do!" Bri & Nick chose not to see each other before walking down the aisle. We were honored to be the spot they chose for their before the wedding shots! Flowers: AJ's Fine Foods Floral Dept. ﻿6.4.16 - Saskia & Michael had a fun and unique wedding reception. From the boots, to the antique chairs, to the DIY décor, the reception perfectly represented their style. Everyone was ready to party, especially the wedding party. 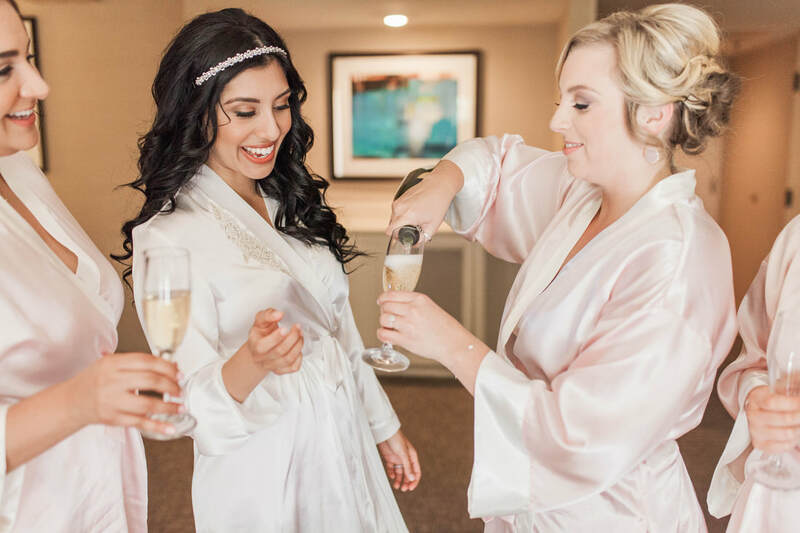 These photos are wedding party goals! FALLin' in love with sunflowers, burlap, and autumn. 10.8.16 Samantha & David's wedding is all about the details. Rustic signs, whicker baskets, wooden barrels, warm colors, and a little bit of sparkle created a fairytale fall wedding. AND we are awarding this couple "most beautiful sweetheart table", wowza! 5.28.17 Becca & Kevin transformed our ballroom with a modern flair, and pops of bright colors. Sequins pillows, shiny silvers, and elegant floral arrangements made the perfect backdrop for this FUN couple. Dessert only added to the fun; we absolutely loved their sparkling wedding cake, candy station and gelato bar.